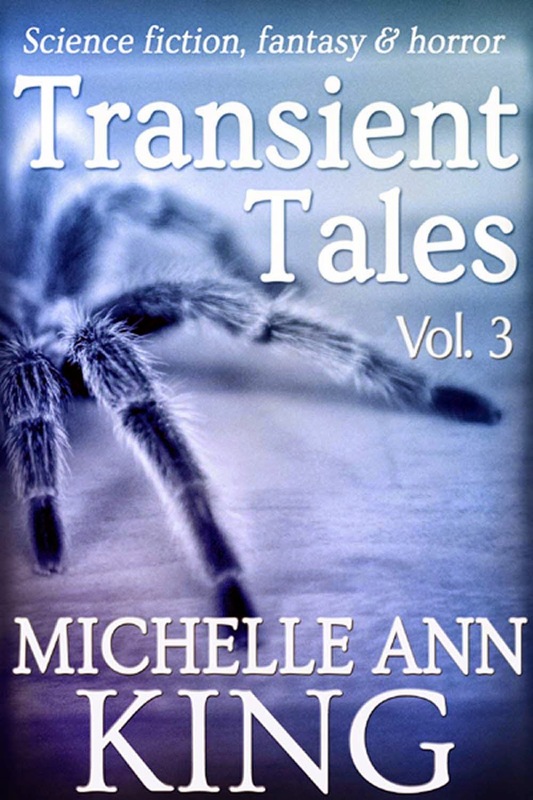 My third short story collection, Transient Tales Volume 3, is now available! Volume 4 is scheduled for November 2014, to be followed by an omnibus edition of volumes 1-4, which will also be available in paperback. The third in the Transient Tales series collects 12 short stories of science fiction, fantasy and horror, totalling 20,000 words and ranging from light to dark and all shades in-between. Volume 3 features demonic spiders, robot wolves, witches, doppelgangers, carnivorous plants, reclusive psychics, immortal gang bosses, apocalyptic survivors, alien voyeurs, flesh-eating criminals, clairvoyants, and God. Sweetie: Sweetie's changed, since the days of the travelling carnival. But she still knows how to teach an audience respect. Wolf, or Faith in the Future: Language evolves just like everything else. There are different words, in the future. And a different definition of horror. Never Leave Me: Katrine knows her story is supposed to end with happily ever after. But what happens after that? The Portal to a Lost World: The phone call comes every year. 'Where are you?' Tollie asks, but she never gets an answer. She hopes she never will. Seeing Red: Even though they're not living on Earth any more, Halden's family are still human—still the same people they ever were. Unfortunately for him. An Object Lesson in Misanthropy: Zoe's never been able to work out what nice guy Bill sees in her bitter, reclusive mother. Today, she's going to find out. Getting Shot in the Face Still Stings: A lot of problems can be solved with a gun. But not all. No Past, No Future, Just Now: The world might have suddenly become a strange and confusing place for everyone else, but Louisa's used to it. She knows what to do. Game Over: Adrian's sick of providing free entertainment for the passengers in his head. He's not going to carry on performing unless he gets something in return. You Don't Want What I Get: Richie suspects he's being cut out of a sweet deal, and he's not happy about that. He wants his fair share, and he's going to get it. There You Are, My Love: If Marcus sees enough clairvoyants, will one of them eventually channel his father's spirit? And is that what he really wants? For Your Safety and Comfort, Please Keep Arms, Legs and Tentacles Inside the Car At All Times: Katie gets worried when her best friend says she's found God—especially when she realises Lia means that literally.